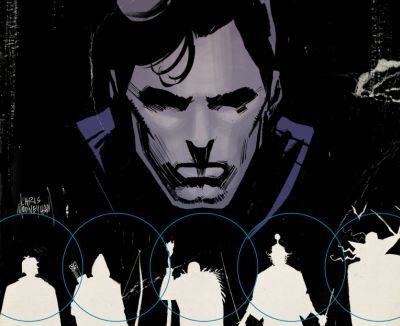 Back in July, it was revealed that Universal Cable Productions had optioned the rights to comic series Five Ghosts and were developing it for television. Now, Syfy has announced they’ve picked up the pulp adventure series to be produced by Universal Cable Productions, Black Mask Studios and BenderSpink. The pilot is being written by Evan Daugherty (Snow White and the Huntsman, Divergent) based on the critically-acclaimed comic series by Frank J. Barbiere and Chris Mooneyham about a 1930s era treasure hunter possessed by five literary ghosts (Merlin, Robin Hood, Sherlock Holmes, Musashi, and Dracula) whose unique abilities he can draw on during his adventures. Black Mask’s Matt Pizzolo and Brett Gurewitz will co-executive produce with BenderSpink’s executive producers Chris Bender, Jake Weiner and producer Jake Wagner. Five Ghosts was funded on Kickstarter in 2012 and previewed at San Diego Comic-Con that year when Pizzolo (who would later co-found Black Mask Studios) shared his San Diego Comic-Con table with then-unknown writer Frank Barbiere. Five Ghosts was picked up by Image Comics and premiered at Emerald City Comic Con becoming one of the breakout hits of 2013.